As of this publication, GCI membership (Ambassadors) had surpassed 10,000 people representing 56 countries. Even as the GCI was still gearing up in startup mode, these members, plus countless others they engaged within their families and communities, responded to several GCI alerts to send coherent energy and care to critical areas of need and crisis around the planet. These efforts of coherent heart are crucial and appreciated. Alerts went for the victims of Hurricane Gustav, conflicts in the Middle East and Democratic Republic of Congo, the financial meltdown and more. Officials at the HeartMath Institute, which initiated and oversees the GCI, were encouraged to see that early membership numbers were in line with initial projections. Greater numbers are projected in coming years, with 50,000 forecast by the end of 2009, as the imperative to create a global coherence momentum grows along with people’s awareness of the need for a shift in human consciousness from instability and discord to balance, cooperation and increased peace. Related to GCI’s primary technological component, the Global Coherence Monitoring System, work is continuing on the prototype sensor site, which collects data scientists analyze for fluctuations and resonances in the magnetic fields generated by the earth and ionosphere. The GCI research team is also in the process of adding additional data sources that will allow them to have a more complete picture of the activity occurring in the earth’s energetic systems. For example, they now have feeds to the laboratory from several space weather satellites that provide data about solar wind speed and interplanetary magnetic fields, and data from other ground-based detectors that monitor the stationary geomagnetic fields. An additional indicator of the activity in the earth’s energetic systems is provided from the worldwide network of random number generators (RNG) maintained by the Global Consciousness Project (GCP). The HMI research laboratory has hosted one of these RNG for more than eight years. Recently, the GCI team met with Dr. Roger Nelson, who heads up the GCP, and Dean Radin and Marilyn Schlitz, who are with the Institute of Noetic Sciences (IONS) and, along with Nelson, are GCI Scientific Advisory Board members. All agreed the three organizations share common purposes on scientific, educational and spiritual levels and that by working together and pooling insights and resources, they can facilitate progress in many aspects of their individual and collective research goals. For example, all agreed that each GCI monitoring site will contain GCP random number generators and the data will be used as an additional key indicator of earth energetics. The research team plans to set up studies that look at correlations between changes in the earth’s magnetic fields and changes in people’s heart-rate-variability levels and rhythmic patterns. Other studies being planned entail either tracking GCI members’ personal health and well-being indicators over a three-month period, or conducting experiments exploring the amplification effects/influence that synchronized groups in heart coherence have on living and natural systems. Construction and deployment of two more of 12 planned sensor sites are scheduled for this year in conjunction with Phase II of the initiative – assuming the funding is obtained. The GCMS data networking and acquisition system, through which sensor data will be transferred to the central laboratory for analysis, is scheduled for completion in 2009. Global Consciousness Project founder Dr. Roger Nelson, a GCI Scientific Advisory Board member, has been busy analyzing the results of data collected by GCP random event generators (REGs) before, during and after U.S. President Barack Obama’s inauguration on Jan. 20. The purpose of collecting data during this historic occasion and other events, which the GCP has been doing since 1998, “is to examine subtle correlations that may reflect the presence and activity of consciousness in the world.” The REG network appears to be influenced primarily by human emotions, but Nelson is always careful to add a general cautionary note by pointing out that In the long term the effects of human emotion on the network can only be identified by patiently accumulating replications of similar events. Figure 1. Shows the network variance of the Global Consciousness Project, random number generator network before, during and after the inauguration of President Obama. For the Obama inauguration, the formal event specification, as it is known, was set for between 6 a.m. on Jan 20 until 2 a.m. Jan 21 EST, a period spanning six hours before Obama’s swearing-in through the inaugural balls. The result is graphically quite striking, with no trend for the first four hours of the period. Then a small but steady trend begins in network variance for about 12 hours before it changes to a period of relative large variance. More examples and explanations of the random number generator network are available on the GCP website, http://noosphere.princeton.edu. The following two graphs show some preliminary data from “Maggie,” the magnetic field detector developed by the Global Coherence Initiative research and development team to monitor the resonances occurring in the plasma waves constantly circling the earth in the ionosphere. 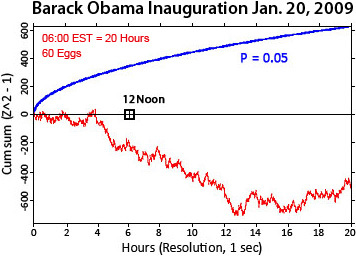 Figure 2 shows the activity occurring at the various resonant frequencies during the four days before President Obama’s inauguration on Jan. 20, the day of the inauguration and the three says after. Figure 3 shows the total spectral power occurring across all the frequencies between 5 and 40 Hertz. Figure 2. This is a plot of daily spectrograms of the Schumann resonances for the four days before, day of, and three days after President Obama&apos;s inauguration. The intensity levels of the resonances are substantially lower the day of and the days following the inauguration than the days preceding it. Figure 2 is a frequency-time spectrogram of the horizontal component of the Schumann resonances. Within the spectrograms, the power at the right side of Figure 2 intensity, of a given frequency is coded in a color scale, at right side of Figure 2, with yellow being the most intense. The typically daily variations in the intensity of the resonances can be seen in the figures. The time of the presidential swearing-in at 12 p.m. EST on the 20th is noted by the red arrow. At the left of Figure 2 is a vertical section through the spectrogram showing the typical resonance structure for Jan 16 on the upper row and Jan 20 on the lower row. The resonances are shown by the red lines that appear as horizontal lines with frequencies of 7.8,14, 20, 26, 33 and 39 Hertz. The daily time periods shown in each daily plot are from 10 a.m. to 4 p.m. PST time. The grey boxes were added to omit the data that was contaminated on several of the days by a local noise source – a solar charger, which was being eliminated. GCI researchers note that an interesting observation of this data is the pronounced change in the activity level of resonances. 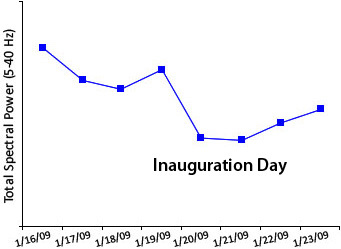 As is shown in both figures, there is a pronounced drop in intensity on the day of the inauguration that persisted during the three days following it. The GCI research team is exploring changes in space weather and other indicators of ionospheric activity such as ion density that could explain the changes in resonance intensity. So far, the changes do not appear to correlate with other indicators that are known to affect ionospheric activity. View new research sections on GCI website Live Data and Commentaries.